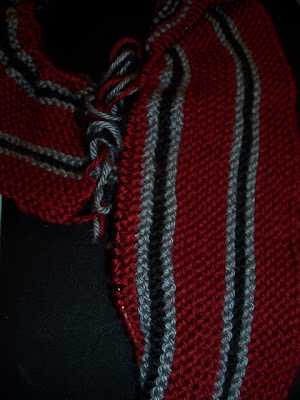 Debbie Does Blog...: Maybe I'm Loopy. Since I still get the urge to knit even when I'm at home hangin' out with Mom, I grabbed some clearance-aisle yarn in a couple different colors and I keep that in my chair at the house. 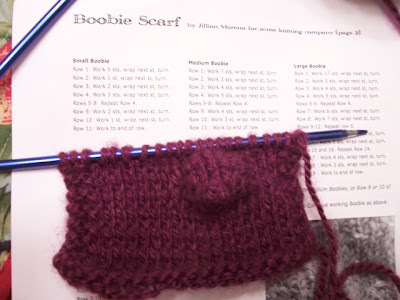 I finally remembered to take my flash drive with me to the library and print that Boobie Scarf Pattern, and I've finally read it through enough times to feel like I could take a shot at it. Tonight, one way or another, I will knit Boobies. Maybe I'll switch to a different ball of yarn, maybe I'll go up a size and use short needles, maybe I'll turn off the damn TV and sit under a lamp; but tonight, I will knit Boobies.